Just over a year ago, Arizona congresswoman Gabrielle Giffords and 12 others were wounded in a shooting spree at a grocery store outside of Tucson, and six people were killed. Yesterday, the alleged shooter Jared Lee Loughner pleaded guilty to the crime as expected. The plea deal came after a federal judge found Loughner competent to stand trial, and Lougher will not get the death penalty. Loughner faces life in prison without parole. He has been treated for schizophrenia since the shooting, according to a report by the Associated Press. Loughner told the judge he understood the charges against him. In a statement, Giffords' husband Mark Kelly said the couple is satisfied with the plea deal. "We don't speak for all of the victims or their families, but Gabby and I are satisfied with this plea agreement," Kelly said. "The pain and loss caused by the events of January 8, 2011 are incalculable. Avoiding a trial will allow us - and we hope the whole Southern Arizona community - to continue with our recovery and move forward with our lives." 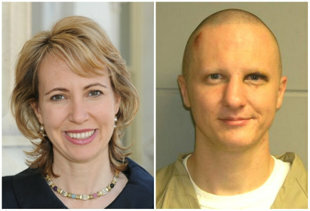 Giffords was Loughner's intended target in the rampage. He pleaded guilty to a total of 19 (WOW) charges, including the murders of U.S. District Judge John Roll and Giffords staffer Gabe Zimmerman - both federal employees - and the attempted assassination of Giffords and Ron Barber, who succeeded Giffords as the U.S. Representative from Tucson.